Luxury pianos – the crème de la crème? A Steinway is widely considered to be the greatest piano money can buy, but the lesser known Fazioli is in a league of its own. A well kept-secret, you might say, Faziolis are extremely limited in production. Only 110 pianos are created each year. No expense is spared in the attempt to craft a piano that is as close to perfection as possible. The gorgeous Fazioli pianos you see above have soundboards that are constructed from the finest spruce in the world. Sourced from the Val Di Fiemme grove in Northern Italy, Fazioli’s selection is the same highly sought after spruce used in Stradivarius violins. As for Fazioli bridges, they are constructed from three different kinds of wood – rock maple, hornbeam and boxwood. This painstaking measure is hoped to ensure that the sound vibration is transmitted from the string to the soundboard without distortion. Like I said, no holds are barred in the pursuit of the “Fazioli Sound’, which boasts clarity; uniformity; a wide dynamic range (a Fazioli will go from ppp to fff without any distortion in fff); long duration; and selectivity – meaning voices can be played with more distinction in polyphonic works. Finally, Fazioli is the only brand in the world that plates all its metal hardware in 18k gold. Whilst this measure seems opulent and over the top, the use of gold helps to prevent tarnishing. 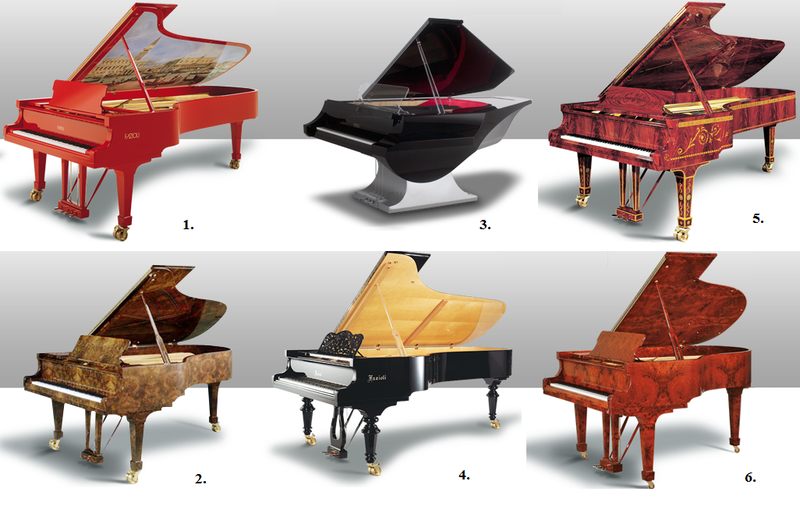 Below is a little commentary on six of my favourite Fazioli pianos (featured above). Bold and in your face, the Marco Polo is coated in a red high gloss varnish. What really sets it apart is the individual hand-painted Canaletto reproduction. The painting depicts the connection between China and Venice, China being the country of the client who commissioned this piano. The Walnut California Brier is finished with burr walnut. The final effect is that a different kaleidoscopic pattern is viewable from any angle! My personal favourite was designed by NYT Line. This is the kind of piano that belongs in a lavish habourside penthouse. Dubbed simply Classic, this piano’s hand-carved music desk is a striking feature, set off against the simple lines of a19th century style piano. Look closely – the underside of the lid is finished with maple wood. Finished in sequoia burr, this piano is adorned with flowers in mother of pearl and features assorted semi-precious stones. This hot number is decorated with Amboina burr, a rare and precious Indonesian wood.